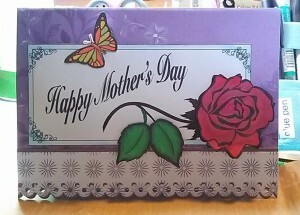 Here is the Mother’s Day I card made using the Mother’s Day Sample Dot-to-Dot on the inside. I prefer to put the puzzle on the bottom half of the inside of the cards, but this time the message to Mom seemed more important. This card uses foam tape to layer the art work for a more 3-D effect. Print out the two pdf clip art files from above. Color in the roses, leaves and butterflies. The extra images will be placed on top of the larger ones to layer with foam tape. I colored mine in different colors and then chose which one I like best to be on top. I then cut out all the images, choosing one of the sentiment frames. 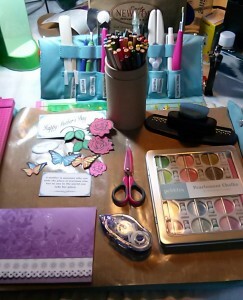 I took the chalk and ran it along the edge of the rose frame and the sentiments frames to add dimension. Cut 8½” x 11″ sheet of heavy white cardstock down to 6½” x 10″. Score cardstock in half to make card 6½” x 5″.